+ Dog Walking Backwards – the wags of the a cappella scene! 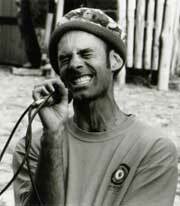 Mal Webb - Vocal gymnast, multi-instrumentist and songwriter. Ballads, beatbox and beyond. A jolly jaw-dropping journeyman. Eclectic, ebullient and even educational. 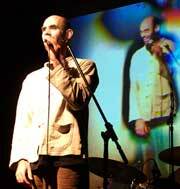 Mal Webb uses a world of vocal techniques and writing styles and plays guitar, mbira, slide trumpet, chromatic harmonica, a loop recording pedal called Derek and the audience. Ani DiFranco said, "you're a freak!" after Mal played support for her. He's like Bobby McFerrin, Aphex Twin and Cole Porter playing Scrabble. Free car parking – Gordon Street church car park. The Rainmakers - first Sydney gig! Eilean Mor's first Sydney gig! Fay White's "Vocal Nosh" comes to town!